This is an illustration for the story by Edo van Belkom in Fantastic Stories magazine, Spring 2001. 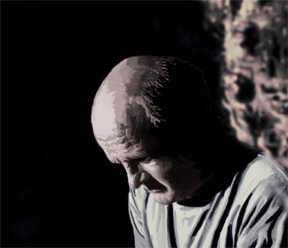 In this story, an old man is living in a cave after some disaster has struck the earth. 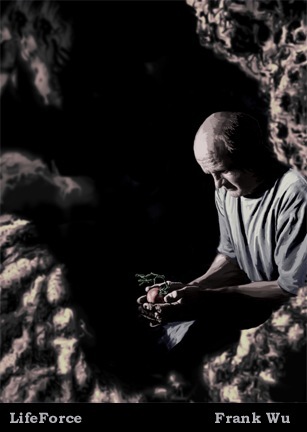 He is desperately trying to get vegetables to grow underground, but he cannot. That is, until his beloved wife is killed by bandits and he buries her body in the garden. Her "lifeforce" allows the formerly sterile ground to be able to bear fruit. The main artistic inspiration for this piece was the work of the Dutch painter Jan Vermeer van Delft (1632-75). Vermeer painted wonderfully delicate scenes of simple people doing mundane tasks - a kitchen maid pouring milk from a jug, someone playing the guitar, a girl sleeping. A typical Vermeer has a composition that is simple, but very solid (large blank areas counter-balance clusters of details); rendering that is precise, but not fussy; but most of all, a quiet, contemplative, almost timeless sadness. It is as if that poor woman in his painting has been holding up that jug of milk for almost four hundred years now, and she will be holding up the darn thing for another four hundred. For this work, I really wanted to capture some of the infinite, timeless melancholy of a Vermeer. That poor man is going to be holding that little tomato - symbol of all that remains of his dearly departed - just holding it in his gnarled, worn-out hands, thinking about his lost past and his lost love, trying not to cry, forever.